Jesse Itzler, founder and organizer of the September 12 "City-to-Sand" bike race, today announced that over one million dollars was raised during the event from pledges from over 3,000 New Yorkers. The $1,026,339 raised for Itzler's 100 Mile Man Foundation will provide college scholarships for qualified inner-city students from the New York area. Tuition at a New York City college is $2,500/year and the 100 Mile Man Foundation will provide 100 students with four-years of full tuition. "We feel a great sense of pride and accomplishment to be able to put together such a great event and raise over a million dollars that will literally change the lives of 100 inner-city New York students," said Itzler. The City-to-Sand bike ride was the brainchild of Itzler, the Marquis Jet Co-Founder and creative philanthropist, who ran 100 miles non-stop for charity in 2006. Since then, Itzler has created ultra-endurance type events to be used as fund-raisers for his 100 Mile Man Foundation. 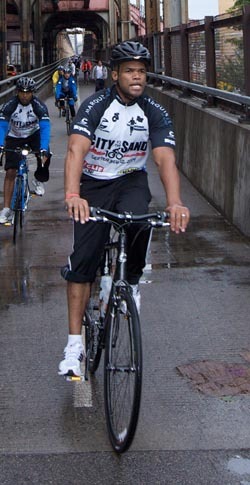 Over 100 riders competed in the ride on September 12, including Darryl "DMC" McDaniels of the hip-hop group RUN-DMC. "The ride was crazy," said DMC. "First of all, I didn't even train for it - which was insane in its own right. I was fine until the 64 mile mark and all hell broke loose. I had hallucinations, my but was killing me - as well as my back, my arms and neck. I was gonna drop off the bike and hop on the train back to The NYC but the voice in my head said 'Remember the kids! Remember the kids!' Jesse Itzler is the most caring, but daring, friend. He put the race together for all of the good reasons of doing something for others."